What does the Church hold as more important: conformity or Eucharist? If you want to be part of the Church, conform. The message also sent to her classmates and their families was that there was something wrong with her desire to be herself because that self didn’t fit a particular image the Church wanted to create. Because she did not fit that image, she should be hidden away. Because she did not fit that image, shaming and excluding her was acceptable. Her family ultimately opted to find another Catholic school and another Catholic parish rather than force the tearful, confused child to wear a dress just to fit in. What should have been a joyful celebration instead became a traumatic experience that caused deep and unnecessary emotional and spiritual wounds. I don’t want to debate dress codes or gender roles or images of femininity and masculinity. I don’t care. I don’t care if she prefers suits and ties to dresses and frills. I don’t care how short or how long she wears her hair. I. Do. Not. Care. I do care very much that a child was denied her place at the Lord’s Table and she was denied her place within the Body of Christ. This. Is. Wrong. There is no spin, no list of rules, no tradition, no hermeneutic that can ever justify keeping a child from Jesus and, worse, telling her that it’s her own fault for wanting to come to the Table as her most authentic self. A 9 year-old does not have the spiritual maturity nor the theological wherewithal to differentiate between God and Church. Through the eyes and understanding of a child, the Church, the priests, the deacons, God, and Jesus are all rolled into one. Because of this, the Church must be very conscious of the messages it sends to our children and the message the Church is sending to its girls and young women is emotionally and spiritually harmful. Our girls are growing up being constantly told that their shorts are too short, their pants are too tight, their shirts are too low, their shoulders should not be bare, and their makeup should be more subtle, but also that dressing too much like a boy is wrong. Our girls are growing up knowing they are not permitted to be ordained. In some places, they are still growing up knowing they cannot serve on the altar. They are growing up with the message that somehow being a girl is shameful. More concerning, our girls are growing up with the subtle message that even though Jesus loves you, he expects you to meet a certain standard in order to earn that love. They are getting the message that it is perfectly normal to have to surrender your authenticity, in part or as a whole, in order to be loved. If it is okay for Jesus to expect these things, it is only natural to expect the same in other relationships. Then we wonder why our young women, who have been raised in the Church and have been taught since childhood about the all-encompassing love of God, are so easily drawn into unhealthy, unloving relationships. Parents and Church leaders will scratch their heads and wonder: Why do our young women try so hard fit in with society? Why are they so willing to give up their very identity for any person or group of people who merely say the things they want to hear? I think what we really need to start asking ourselves is whether or not it could be because we’ve taught them to be fake. Could it be that the reason they work so hard to mold themselves to their group of friends is because they’ve been subtly taught from childhood that conformity is the path to love and acceptance? Could it be that the reason they tolerate disrespect in relationships is because a disconnect between hearing, “I love you” and actually being treated with love and respect seems normal to them? Amazing, intelligent young women raised in loving, faithful families, are reaching young adulthood and selling themselves out. In part, they do this because they have been taught that to do so is not only normal, it’s expected. Until we start broadcasting and reinforcing the message that our girls are beloved daughters of God – full stop, no checklists – then the Church will continue to fail her daughters. Pope Francis has decreed that Mary Magdalene will now have feast day on the same liturgical level of importance as the other apostles. For nearly 1500 years, she has been described as the apostle to the apostles. She has had a memorial day on the liturgical calendar for centuries, sharing the date with fifteen other memorials. Now that the day is a feast, the Gloria will be sung and prayers dedicated to Mary Magdalene will be offered. The celebration carries more weight. This is beautiful thing. But… I have questions. Lots of them. Why announce the change in the liturgical calendar now? This announcement follows hot on the heels of the statements Pope Francis made about convening a committee to study (yet again) the possibility of ordaining women to serve as deacons. It also was timed during a three-day Jubilee Celebration of Women Priests which included participants from the Association of Roman Catholic Women Priests and Women’s Ordination Worldwide, and was widely also publicized by A Church For Our Daughters and Call to Action. On the Solemnity of the Sacred Heart, Pope Francis made an announcement recognizing Mary Magdalene’s equal importance to her brother apostles while in the Piazza Pia activists from WOW held a purple stole witness for the ordination of women priests followed by a procession to Saint Peter’s carrying a petition titled Open The Door to Dialogue. So either this was a very lucky coincidence for the supporters of women’s ordination or a very shrewd marketing maneuver by Pope Francis to reiterate his message that the Church needs to create a greater (still undefined) role for women. It should be duly noted that all Roman Catholic Women Priests have been excommunicated lata sententia for heresy, as have most of their public supporters. Attending a liturgy held by a Roman Catholic Woman Priest is an act of heresy. Members of the other three organizations are also considered out of bounds on many issues but since their actions are more indirect, they have not yet faced the same harsh penalties. Why did it take so long? What was the Church so afraid of? The long held argument against the ordination of women centers around the scriptural accounts of Jesus’ followers. In the simplest of terms, the Church asserts that because Jesus chose to enter the world as a man and chose only men to be apostles, then clearly Jesus intended only men to serve as priests. No matter what position one takes on the ordination of women, one cannot avoid the obvious question: If Jesus intended for only men to serve as priests, why did he choose to first appear in his risen form to a woman? Furthermore, why did he then choose to send a woman to announce his resurrection? Keeping in mind his divinity, did Jesus not foresee the way these choices would influence the Church? Did the apostles, who were so entrenched in their patriarchal society, miss the message, as they so often did? Is it at all possible that by choosing to send a woman to announce the Resurrection, that Jesus was also sending the message that women had an equal, if not superior, role in proclaiming the Gospel? After all this is Jesus we’re talking about here. He could just as easily have appeared to the disciples in the locked room and foregone the encounter with Mary Magdalene. So why didn’t he do that? If we aren’t looking for that reason, we’re missing something. Earlier this week, Pope Francis answered questions at a meeting of the International Union of Superiors General, a gathering of 900 women religious leaders. He was asked about the ordination of women as deacons. His response was that he would call for a commission to study of the historical role of deaconesses and whether women could be ordained to this role today. This is a far cry from the usual resounding NO GIRLS ALLOWED response that is the stock answer whenever the words ordain and women appear in the same sentence and that fact alone was enough to send the internet into a frenzy. Supporters of women’s ordination cheered the idea as a baby step forward. I was tagged in multiple posts and comments on social media. Did you see this? This is awesome! Finally! But I’m not super excited about the statement for a number of reasons. First of all, this was one of the pope’s infamous off-the-cuff remarks, which is Vatican slang for doesn’t mean a darn thing. Secondly, if one read below the fold, the pope was also asked about a woman delivering the homily at Mass. The response was the customary NO GIRLS ALLOWED. Finally, the Church has been committed to ‘studying’ the possibility of ordaining women to the diaconate since the Second Vatican Council, a.k.a before I was born. Leading Church historians and theologians have used the exact same evidence to argue completely opposite positions. Historically speaking, yes women served as deaconesses in the early Church. There is not only reference to this in scripture but also in records of early Church councils where there is discussion about the rite of the ordination of women deaconesses, specifically the Council of Chalcedon in 451. What has been refined and passed down to us is that deaconesses assisted with the baptisms of other women during a time when full immersion baptism would have required baptismal candidates to be naked. Scriptural references, however, speak of women preaching in the synagogues alongside the men. So what happened? The question centers around whether these women were merely given a blessing or whether there was an imposition of hands as there is in the Sacrament of Holy Orders. The practice of ordaining women as deaconesses was eventually ‘clarified’ and the role of women was eliminated altogether. That clarification came at a later Church council, later being defined as 1000 years later so hardly eyewitness apostolic kind of stuff. Be that as it may, the silt of centuries of Church teaching builds upon earlier layers of deposit and, right or wrong, it becomes solidified as tradition. Could the Vatican reinstate the order of deaconess? Yes, absolutely. The foundation is there both in scripture and in tradition. More and more highly placed archbishops and cardinals are starting to raise that possibility. While this generates a lot of excitement for supporters of women’s ordination, the reality is that a women’s diaconate would likely look nothing at all like the men’s diaconate we have now. Our deacons can proclaim the gospel and preach the homily at Mass. Pope Francis clearly restated the Church’s position that while a woman may offer a reflection at a prayer gathering, at Mass the priest or deacon delivers the homily in persona Christi, in the person of Christ, and thus must be a man. Sadly, this means that any hope that reinstating the order of deaconess will lead to us hearing a woman preach at Mass is decidedly misplaced. The only way that will happen is if, and only if, the Church revises its definition of what it means to operate in persona Christi and, since such a revision would also open the way for women to be ordained not only to the diaconate (as we now know it) but also to the priesthood, it is highly unlikely to occur in my lifetime. Do I hope the Church might take a step, any step, even a tiny one, toward ordaining women? Yes, very much so. But hope has to be tempered with reality. The reality is that the Church would have to reexamine more than a millenia and a half of teaching before a woman could ever be allowed to preach at Mass. While the world looks at progressive changes in terms of years, the Catholic Church looks at progressive changes in terms of centuries. Change may come, but at 43, how long am I willing to wait for it? I’ve been told that younger women in the Catholic Church need women like me, women with passion, education, and most importantly a big mouth, to stay in the Catholic Church and push for change. But sometimes the only way to effectively create a change is to create a vacuum. Some recent comments from a Catholic archbishop in Spain made a bit of a splash earlier this week on the internet when he spoke in his homily about domestic violence and how women draw a macho reaction by rejecting their partner’s demands or by asking for a separation. You can read the story here or here. In these modern times, when more attention than ever has been focused on women and their roles in society, domestic violence has been hauled out into the light and exposed for the widespread, insidious evil that it is. We can read more than ever before about the various forms of abuse and its short- and long-term effects. Articles abound which detail the ways in which abuse is often perpetuated in other forms long after a woman exits a violent relationship. There is plentiful research, much of which has been translated into layman’s terms, that demonstrates that not all abuse is physical and psychological damage from abusive relationships can last for years. So that brings me back to church. As one who is actively dating other churches, I spend a serious amount time reading official statements and following various synod gatherings, especially from Catholic, Evangelical Lutheran, and Episcopal churches. Back in November, a document was issued from the ELCA which specifically addressed gender-based violence. It contained a confession of individual and corporate sin in which the church admits to failing in the past to address such violence and for its role in not doing enough to counter bad theology which allowed for a misinterpretation of scripture in such a way as to promote patriarchal systems based on the view that women are ‘lower’ than men in creation. It went on to address the practicality which every congregation is likely to face at some point: having a woman and her abuser both as members of the congregation. In this situation, it was stressed that the safety of the victim is to be the greatest concern. Abusers, while they must be cared for, must also be held accountable not only to the victim but also to the community of faith. Congregations are strongly encouraged to have specific guidelines and plans of action to cope with such situations. As a domestic violence survivor, I read it with great interest when it was issued but I didn’t do much of a real comparison with Catholic statements at the time. The comments this week from the Catholic archbishop touched a very raw nerve and so I decided to dig a little deeper. 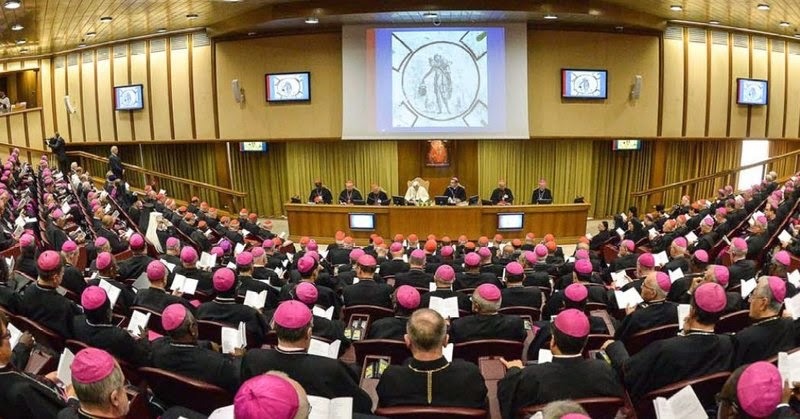 As I had written on this blog previously, the recent Extraordinary Synod on the Family in Rome did not have much to say about domestic violence except as it explicitly related to women’s role as mother. As I scoured the internet now, I did manage to find a relatively new document from the U.S. Catholic bishops on domestic violence that was long on scripture and short on any real practical guidance. Accountability is mentioned only once as a bullet point with no specifics whatsoever. When a woman finds herself under attack at home and seeks the help of the Church, the clergy especially have a responsibility to not only refer her to specialized counseling services but also to ensure that she has a safe haven within the community. Abusers can, and should, also be referred to specialized counseling but they must also be held accountable for their actions. This leads me to ask the questions of my Catholic brothers: what does real Christian accountability look like? When do we need to move beyond pastoral care to exercise the pastoral authority we claim to have been given through apostolic succession? Perhaps it means the messy work of assisting an abuser in transitioning to a new parish away from their victim. Perhaps it means putting safeguards in place that allow a victim new to a parish to ensure that their abuser does not follow them. But for as long as accountability remains an undefined bullet point, victims will continue to suffer needlessly and for this the Catholic Church is accountable. And as if all that wasn’t enough fun to watch, now that Pope Francis is back in Rome, we have the Extraordinary Synod on the Family. I’m curious to see what will come out of it all. So much talk about divorce, remarriage and annulments certainly pricks up my ears. My longtime Twitter nemesis, Fr. Paul is in Rome observing the Synod from the outside. I asked him if he knew if the topic of domestic abuse was on the agenda for discussion. He hadn’t seen anything at that point and at his suggestion, I read through the Instrumentum Laboris (working document of the synod) and found not a single mention. ***sigh*** Why am I not surprised that a room full of celibate men wouldn’t even think to include an issue that effects 1 in 4 women, 1 in 7 men, and certainly impacts the entire family. I have searched periodically for the last eight years and I have yet to find any official Vatican document of any sort that deals with violence in the home. Plenty to say about what is or is not acceptable in the bedroom but abuse of a spouse is never mentioned. Yes, I know, I’m a cynic. And yes, I know, the Church in no way condones violence. But if you’re going to gather to discuss the pastoral issues facing families, particularly divorce and remarriage, don’t you think it might be common sense to discuss WHY people get divorced in the first place? Domestic abuse is certainly high on the list of reasons. Then the bombshell hit. Archbishop Paul-Andre Durocher of Gatineau, Quebec proposed discussion of ordaining women the diaconate. I almost dropped my tea when a friend texted me that newsflash. Finally! Someone with a little authority making the same argument I’ve been making for the last few years. Now the people-watching gets really interesting. The traditionalists immediately started howling that women can “just go be nuns” and “they don’t need to priests to serve”, even though the discussion was clearly about the diaconate not the presbyeriate. The moderates hemmed and hawed and clucked their tongues while making the usual patronizing, non-committal statements about the need for the “feminine genius” and “expanded roles for women”, neither of which are ever defined. Then there are the liberals, who went wild with hope that there was finally a real discussion of women having a role in liturgical ministry and some sort of real voice in the Church. From the cynical outsider perspective, I see a whole lot of posturing. And it makes me wonder which message these men are keeping to: their own or that of Jesus. Because Jesus was certainly talking to the women about their situations rather than telling them that this is how it was going to be. Jesus addressed the pastoral realities of the people he met, not just the theological ideal. It seems like the Vatican forgot that centuries ago and is too entrenched in its own traditions to admit that it may need a course correction. The Catholic Church is missing half the of the voices and half of the reality. The theologically ideal Catholic woman is a either nun or married (once, forever) with children. That is not the pastoral reality. And let’s not forget that a woman’s perspective on the Gospel is not heard from the pulpit on any Sunday, ever. Finally, I ventured into the online debate on women’s ordination and the anger, hostility, insecurity and general nastiness of some of the Catholics I encountered was really sad to see. The Vatican has firmly established in the laity, and a majority of the clergy, an accept-everything-or-get-out mentality. I suppose that seemed wise in light of the Reformation, but with the 500th anniversary of the Reformation approaching, I have to wonder if that mentality isn’t going to eventually suffocate the Catholic Church. Lent this year has been – to put it mildly – an experience. The last two weeks have been no exception. I was quite publicly and unfairly humiliated on March 11 by supposedly good Christians. Even before I had recovered, that was followed by gathering with family from March 13-15 to celebrate my niece’s wedding in grand style. Thank God for family! Spending time surrounded by family was by far the best medicine. Yes, by Saturday night, I had bounced back and I got my Uptown Funk on out on the dance floor. There is likely video floating around somewhere. Things haven’t slowed down any this week. If you’ve been following along recently, you know at the end of February I got into a lengthy debate with a Catholic priest on Twitter about women’s ordination. It really got my Irish up and yet after about a week, when I had cooled off a bit, I realized that in spite of our completely opposite opinions on the topic, this debate with Fr. Paul pushed me into clarifying where I stand, not just in (or out) of the Church but also with God. I’ve written before on this blog about how much the lack of civility on social media pains me, how we cling to what’s ours to the point of injuring another. Yet in over five hours of debate, that hadn’t happened with Fr. Paul and I. After about the third hour, I probably deleted more tweets than I posted as I was determined to keep my big mouth in check. Our debate stayed civil to the end. And because of that, it was productive rather than destructive. Once that realization sunk in, I felt strongly that I should message Fr. Paul and thank him for making me think, which I did. We recommended a few books to each other and I told him if his mission work ever brought him to Connecticut, to let me know and we’d get together, have a non-denominational cup of coffee, and continue our discussion in person. His home parish is in Ontario and his mission work takes him all over Canada, the U.S. and beyond. Surprise! He replied that he was leading a parish mission in Rhode Island towards the end of March and perhaps that wasn’t too far. Everything in me said, Just Go! I looked at a map and it was a little bit of a drive, but totally doable. Part of me knew this was going to look insanely flaky to those around me and yet the feeling that I needed to go was overwhelming. For whatever reason, I knew God wanted me in Rhode Island. So I signed off a day from work to drive to Pawtucket. To take a day off, drive a couple hours to meet up with someone I met by arguing online was crazy enough but it was made even more crazy since it was two days before my vacation started. And yet, I was supposed to do this. I felt it in my bones. I couldn’t really explain to anyone why there was such an overwhelming feeling that I must go, but I knew beyond all doubt that this face-to-face had to happen. Not going was never even on the table for me. So Wednesday morning, I dropped my boys at school and drove the two hours to Pawtucket, having no expectations whatsoever of how this day would shake out. I am so very glad I went. A friend asked me after I got home, “Did he save you or did you save him?”. I answered, “Maybe a little bit of both.” Most of our discussion was on life up to this point. Turns out we are both the youngest of seven. It’s always fun to meet someone who really understands that there is ‘Family Crazy’ and then there is ‘Big Family Crazy’. Those of us who live Big Family Crazy approach things differently, and being the youngest even more so. We talked about many of the topics I’ve posted passionately about on Twitter: abusive relationships, divorce, and annulment. We talked about my RA miraculously going into remission and going back to school. Finally, he asked how I ever ended up finding a home in a Lutheran congregation. He told me that some of the garbage I’ve encountered in the Church never should have happened and for that he apologized on behalf of the Church. Up to that point, I hadn’t even realized how much I needed to hear that apology. There were always bigger things to deal with and junk that I had brushed aside as it happened had hurt far more than I’d ever admitted. My views on women’s ordination have not changed. Nor am I beating feet back into the Catholic Church. But Fr. Paul hit something on the head – I will always be Catholic. It’s who I am. And I deserve to be Catholic. I am a daughter of the Church. To be Catholic and leave for another denomination is to settle for second. Why would I ever do such a thing? Because I know I deserve more than the Catholic Church will ever allow me. I deserve to hear a woman preach. I deserve to hear a woman pray the consecration, to echo what I hear in my own soul. I’ve known I deserve that much since I was a small child, before life played hardball. I know that everything I have been through in my life serves a greater purpose than simply my own personal journey, on that one point we were agreed. He asked me to remind myself every single day that I am a daughter of God Most High. I am a masterpiece and thus a piece of the Master. He then told me, “God isn’t done with you yet.” I’ve heard it said before – exactly the same way – from an ER doctor after I had cheated death by 1/8 of an inch at age 19. To hear it again was startling. Why? I don’t know yet. But I have five days alone on the Cape coming up to ask why. We parted company as friends. He gave me a blessing and encouraged my ongoing social media feistiness. Before I drove home, Fr. Paul graciously took the time to give me a tour of the beautiful church with its incredible frescoed ceilings and magnificent windows. It was absolutely breathtaking. Impulsive and crazy and flaky as it may have seemed to make that trip, I had spent my day precisely as I was meant to. I drove home feeling very much at peace. “Ah. He likely found some tasty grass to nibble on just this side of the fence. Don’t mind him. He’ll find his way home.” he replied and sent her off to play. “Not to worry. It’s just one of our neighbor’s flock and is a likely just very curious fellow.” He sent her off to help her mother in the kitchen. They all sat down to supper and after they had finished eating, the children cleared the table and started the dishes. The daughter returned a third time, insistent that the same sheep was still looking at her through the fence. Intrigued, Sean finally decided that perhaps he needed to take a closer look at this nosy sheep. Looking out the window, he saw nothing odd about the sheep. He figured maybe he should take a walk and as he drew closer he realized something was wrong. The sheep didn’t make a sound or even try to run away. 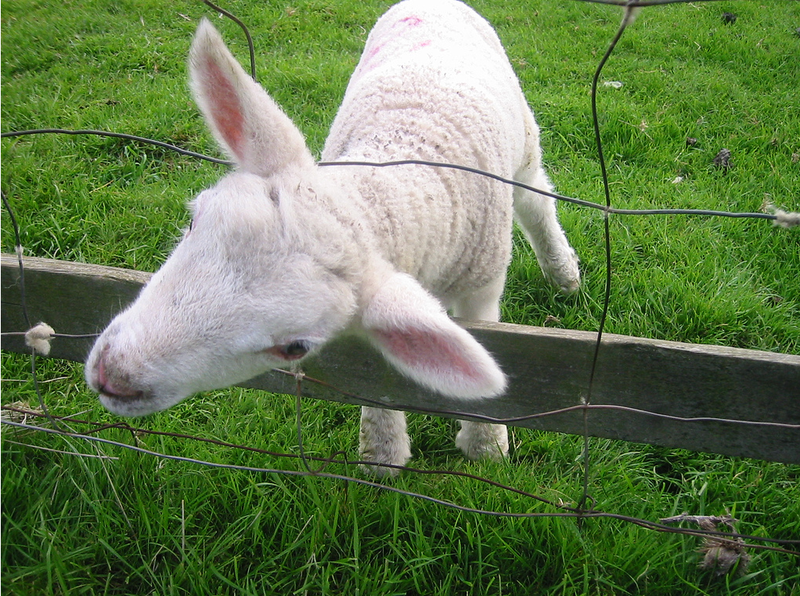 When he got right up to it, he could see what they hadn’t been able to see from afar: the sheep was stuck in the fence. Worse, the poor thing had been completely devoured where it stood and only the head and front leg remained intact. Seriously guys, can’t we do better than that? I know these are the rules. I get it. But please realize that if the best answer the shepherds can come up with is, These are the rules. there are a lot of sheep who are going to stay stuck in the fence. They’re going to stare back at pulpit with empty eyes, looking for all the world like they’re part of the flock when in reality they’ve been eaten alive by a myriad of doubts and emotions until they end up spiritually dead. If the Catholic priests are to be the shepherds Pope Francis is asking them to be, if they are really going to smell like their sheep – all of their sheep – they need to take a little walk along the fence line and figure out how to help the ones who find themselves caught in the fence. Either find a way to guide them safely and fully into your pasture or find a way to turn them loose so they are free to find safety in another one. Why do I keep writing about what I see in the Catholic Church? Because I hear things that some priests never will simply because I’m a woman and I’m more out than in now. That makes me a safe sounding board. I hope by bouncing back what I’m hearing, maybe, just maybe, it will open up the floor for a more honest conversation about women’s ordination. No, the rules won’t change but maybe given an honest conversation, some of those women who find themselves caught in the fence will either find their way back in or gracefully find their way out. A true shepherd would rather see his sheep safe in another pasture than dead in the fence. After all, a good shepherd can always recover a lost sheep.